When my mother offered to have the kids stay at her house for a slumber party, I accepted, as they say, with alacrity. Chris was on the East Coast for work, Emma was teething, and Ben was perfecting his signature “You Can’t Make Me” attitude that infects every preschooler on occasion. In short, I was maxed out, in a way that anyone with young children will immediately understand. 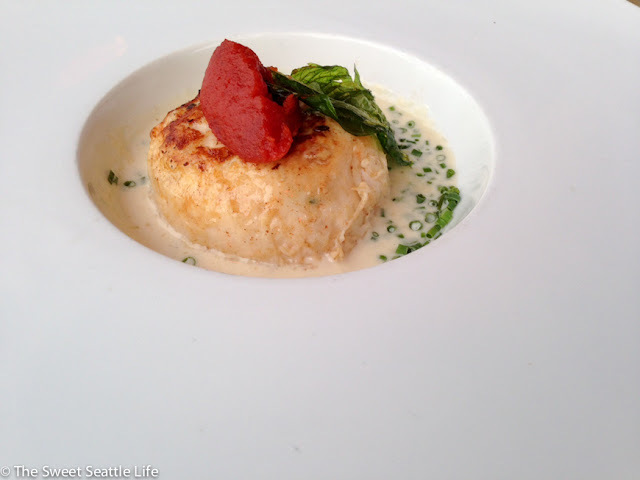 That afternoon, in a moment of pure serendipitous luck, The Edgewater Hotel in downtown Seattle called to see if we’d be interested in spending the night at their iconic Elliott Bay establishment. Why, yes. Will you let me come this minute? I refuse to use the word ‘staycation’ but given that blissful-night-away-from-screaming-toddlers is a bit verbose, we’ll just settle for ‘exceptional mini vacation’. The view from our room. Anyone interested in a dip? The Edgewater Hotel is where my beloved godmother Laurie was married when I was 10 years old. I was so excited for her upcoming nuptials that I magnanimously offered to serenade the bride and her father on clarinet as they walked down the aisle during the ceremony. In a move that will perfectly illustrate how much I adore my godmother, Laurie graciously accepted, despite knowing full well the extent of my clarinet skills. My Dears, I’m quite sure that such a rousing rendition of Hot Cross Buns has never before reverberated through the hallowed halls of the Edgewater's banquet room. To hear Laurie recount the tale, I called her up a few days before the wedding to tell her that my musical masterpiece wasn’t quite ready, and that perhaps she’d best settle for the traditional wedding march after all. I would be happy to be a flower girl, however. In case you were wondering, I killed it in the flower girl department. 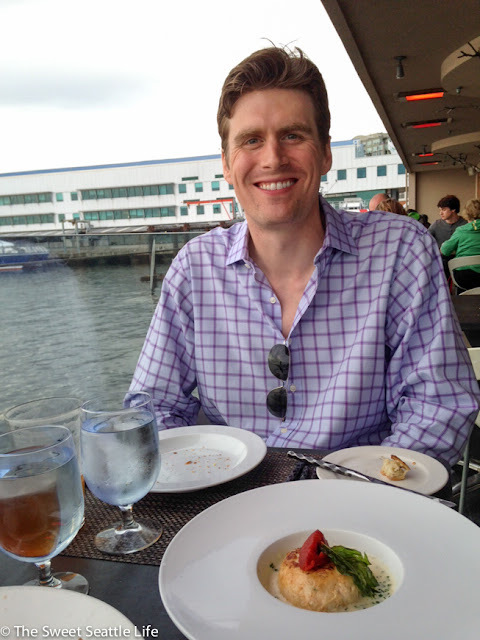 Anyway, suffice to say, it’s been a few years since I’ve been at the Edgewater so we were happy to accept their offer. We dropped the kids off at my mom’s house and made a beeline downtown. I had grand plans for our little get-away that included a walk down the waterfront promenade, a trip to the aquarium, a ride on the Seattle Great Wheel, and a mosey through Pike Place. I even looked into Riding The Ducks. You know, all the touristy things you aren’t supposed to do because you live here and have to maintain your local coolness factor. 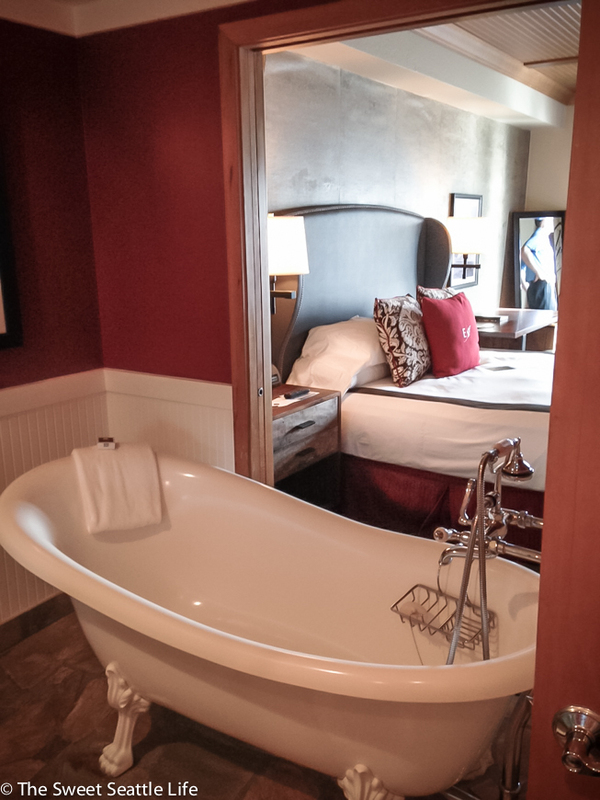 That is, until I saw that our room came equipped with an old claw foot tub and a fire place. Ahem. Sometimes the best laid plans are meant to be discarded in favor of a good soak and a magazine. Especially if they’re not going to be interrupted by screaming toddlers. 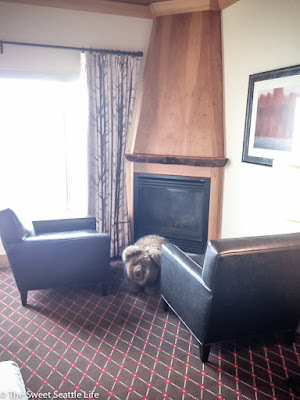 By the way, that wee beastie peering out from in front of the fireplace is a faux bear footstool, much better than an actual specimen, in my humble opinion. When we first walked in, I thought they’d given us the wrong room; one that was already occupied by another hotel guest and his pet. But no, it’s thoroughly fake. And they can be purchased in the gift shop, incidentally. 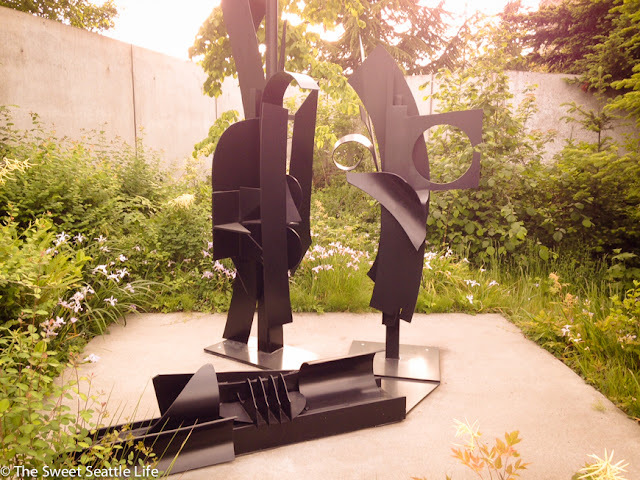 We did make it out to the Olympic Sculpture Park for a nice little pre-dinner amble and you should definitely head that way if you haven't been by recently. But we couldn’t tarry for long as we had reservations at Six Seven and is doesn’t do to be late when food is headed in your direction. Being hardy Pacific Northwesterners, we opted for the exterior Bay-side deck. It was gorgeous out and the sun was blazing down behind the Olympic Mountains. Fifteen minutes into the main course however, the sun officially set, the wind came up, and we froze. At which point the staff turns on the heaters and brings out blankets (!) for us poorly-clothed diners. Decadent, no?! But I’m getting ahead of myself. Chris and I usually lean towards seafood for appetizers: roasted Penn Cove mussels with caramelized onions and smoked bacon, followed by a soft Dungeness crap and shrimp cake. Scrumptious. 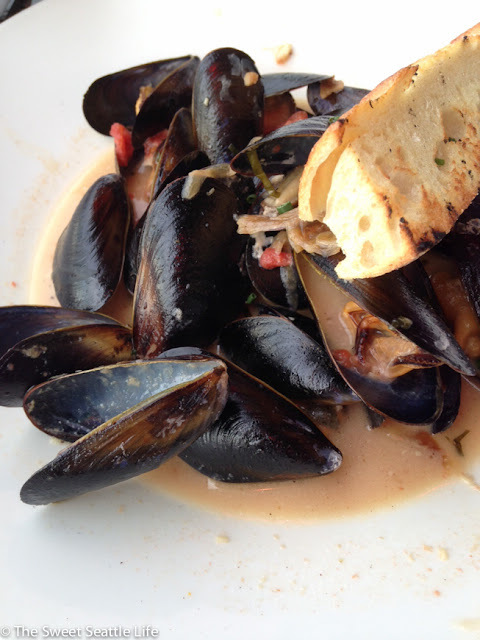 The mussels were some of the best I’ve had in a very long while. Chris continued the seafood trend by ordering the seared scallops with wild mushrooms for his entrée. 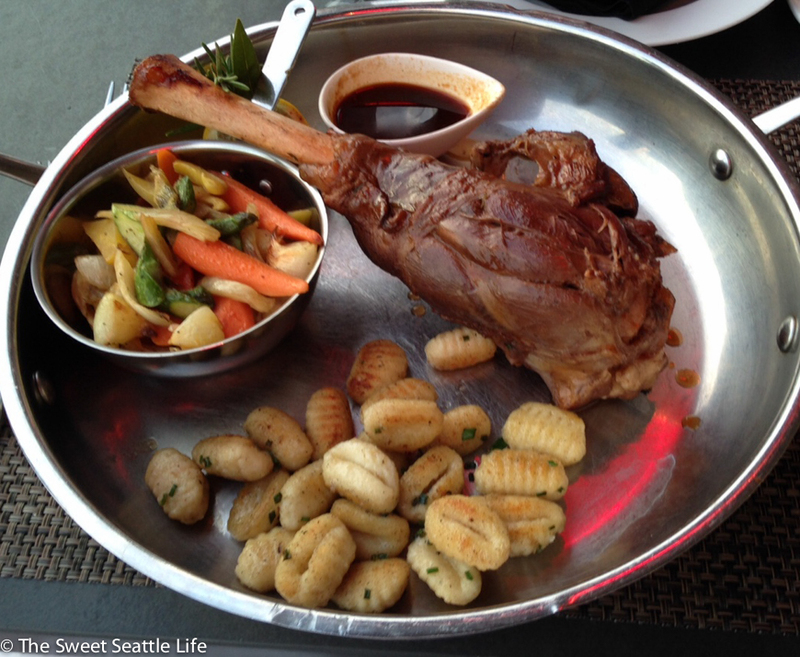 I opted for an enormous braised lamb shank with gnocchi and root vegetables. It was fantastic...and I had leftovers for both lunch and dinner the next day. Always a win, yes?! I wish we could say we headed out to party the night away at local Seattle bars and clubs...but a good snooze for a sleep-deprived parent is not to be missed. The next morning, Chris walked up the hill to his office while I went off to collect the munchkins from Grandma’s house. A quick but delightful intermission from daily life. My Dears, this post was sponsored by the Edgewater Hotel. As always, all opinions are exclusively our own.